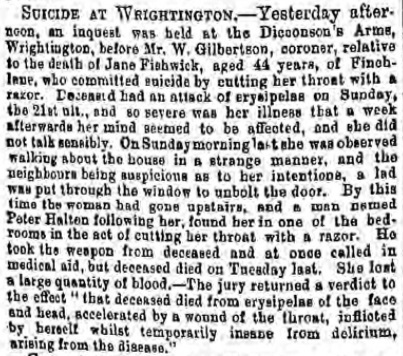 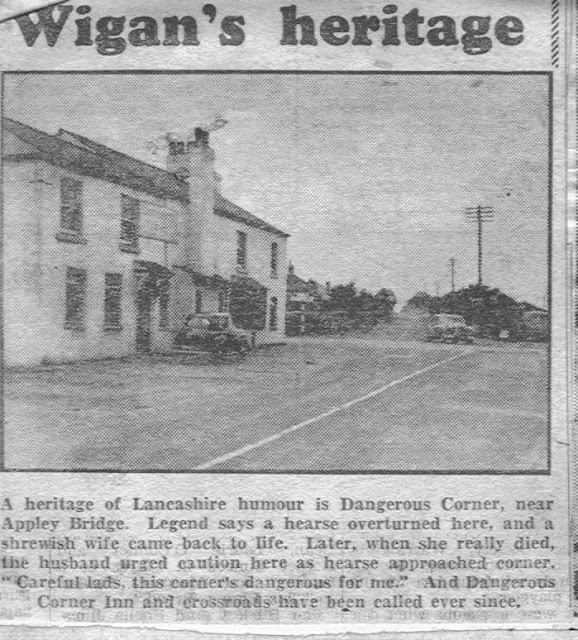 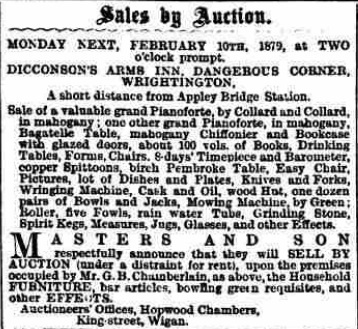 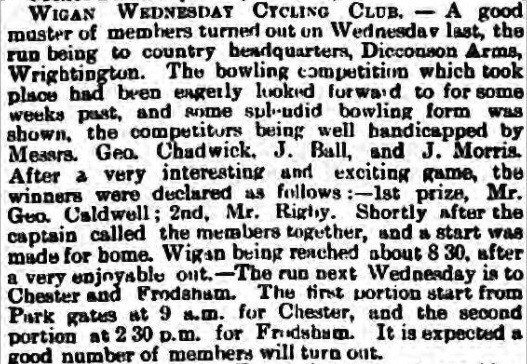 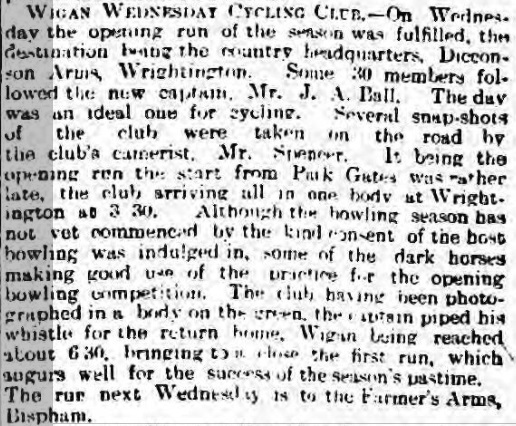 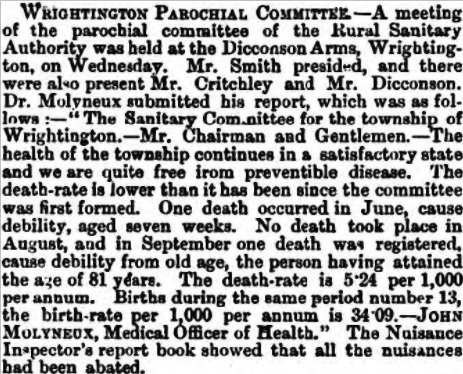 The Dicconson Arms lies within the Wigan Borough these days but was originally on the edge of the parish of Wrightington, hence the inclusion in my blog. 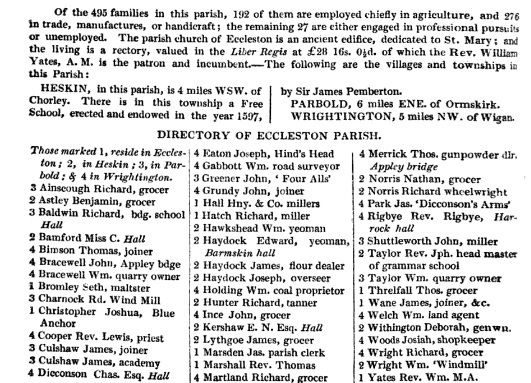 It first appeared on the 1825 directory (shown below) and remains open to this day. 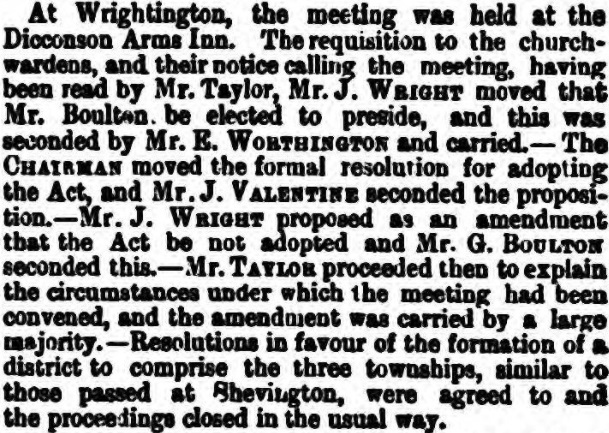 Listed landlords at the Inn were Jas (James) Park (1825), Richard Wilson (1841), John Jones (1851), Thomas Monk (1861-71), Edward Gorton (1881-1912) and Richard Gorton (1912-38). 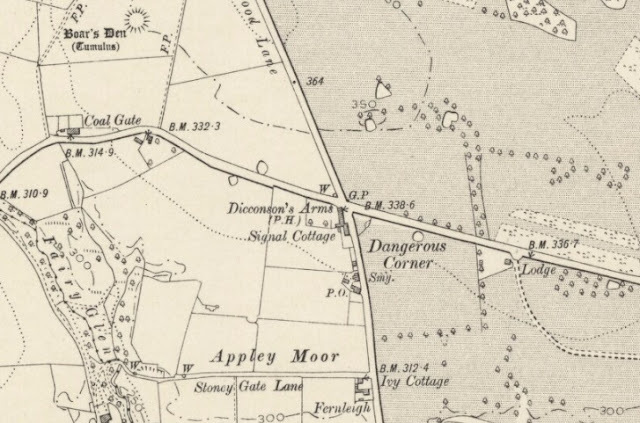 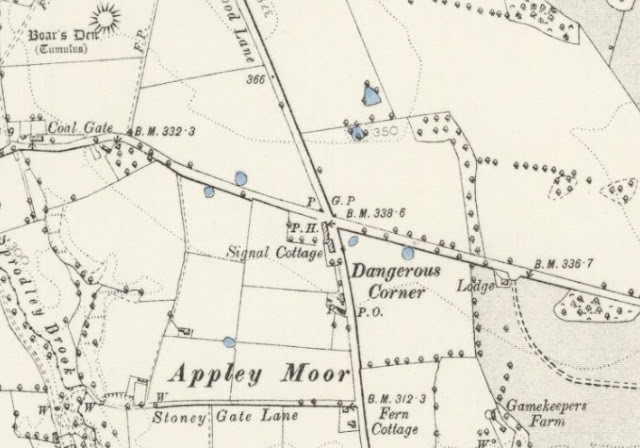 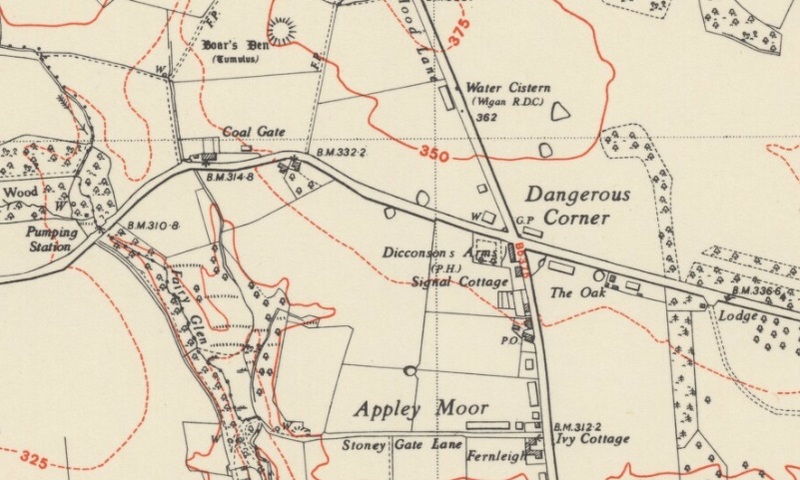 Recorded on the map as "Dangerous Corner Inn" it is unclear this was ever its correct name, as the census and directory records confirm it was always known as the Dicconson's Arms so this may have just been guesswork on the part of the cartographer. 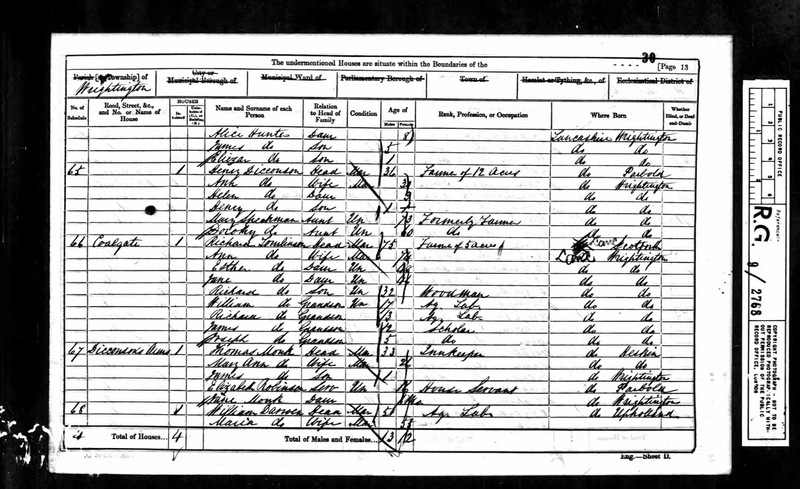 The 1881 Directory below confirms Edward Gorton was running the Inn at that time. As landlords for over 50 years at the Inn the Gortons probably deserve an extra mention on this blog. 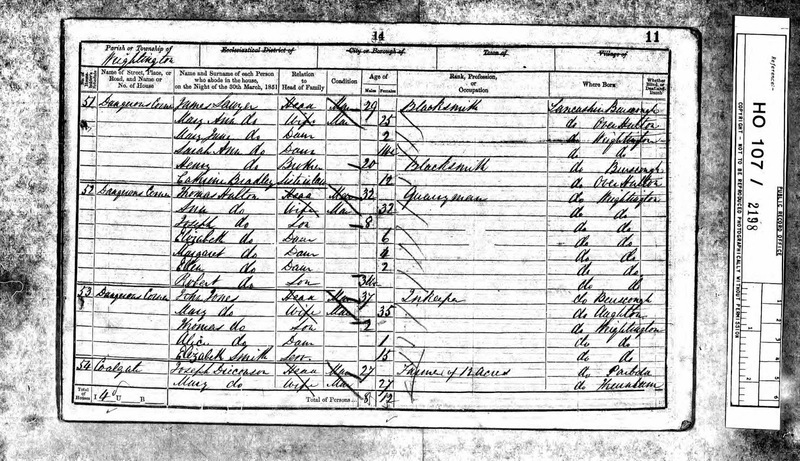 Edward Gorton (1836/9 - 1912) was born in Wrightington, Lancashire, the son of Richard Gorton (1815-) a Quarryman from Wrightington and Margaret (1810-) from Dalton, Lancs. 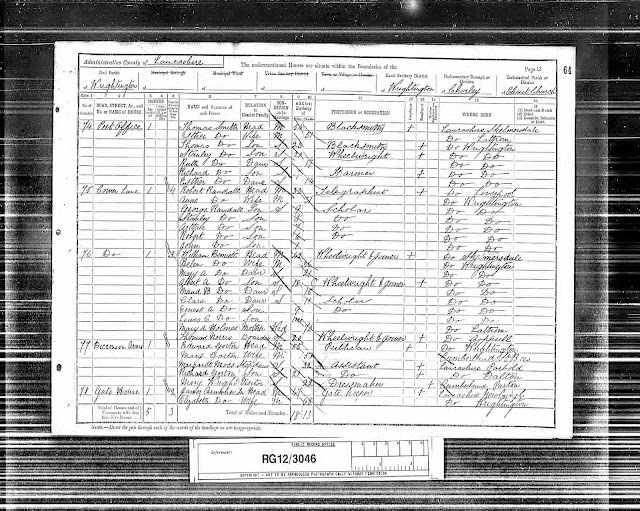 Edward had a sister Margaret (1842-) and brother Richard (1850-). 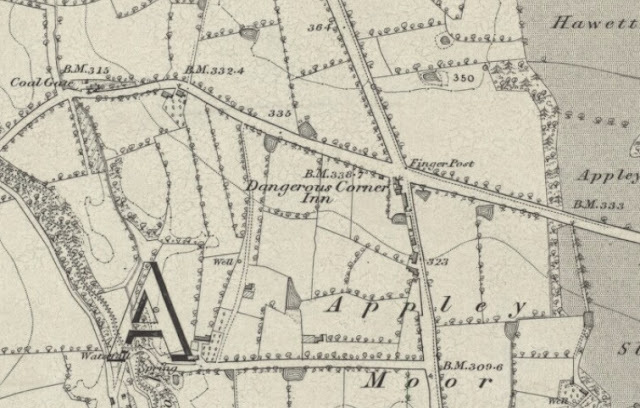 In 1851 they were living at Dalton Lane, Dalton. 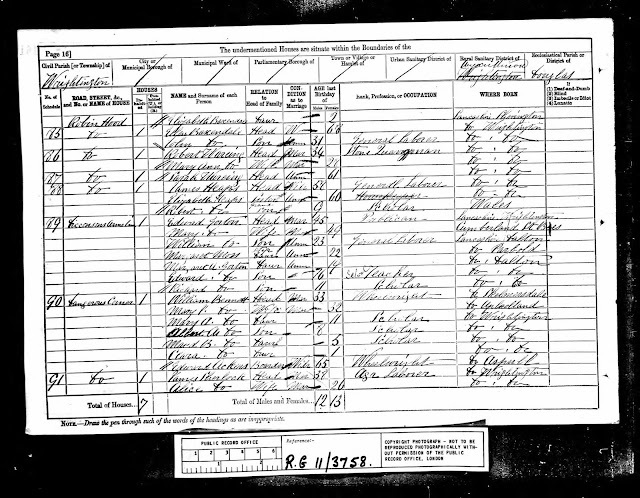 Edward married Ann Mawdsley, 28th Dec 1857 in Thomas the Martyr, Upholland, Lancs and they had four children, William Gorton (1858-), Elizabeth Gorton (1860-), Margaret Ann Gorton (1862-) and Edward Gorton (1865-). 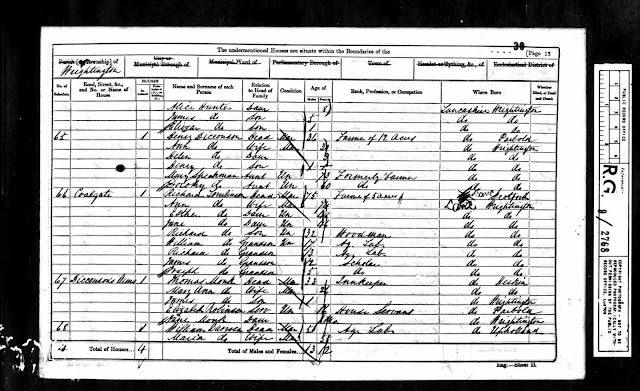 In 1861 Edward was an Agricultural Labourer; the family were at Blackburds House, Lees Lane, Dalton. 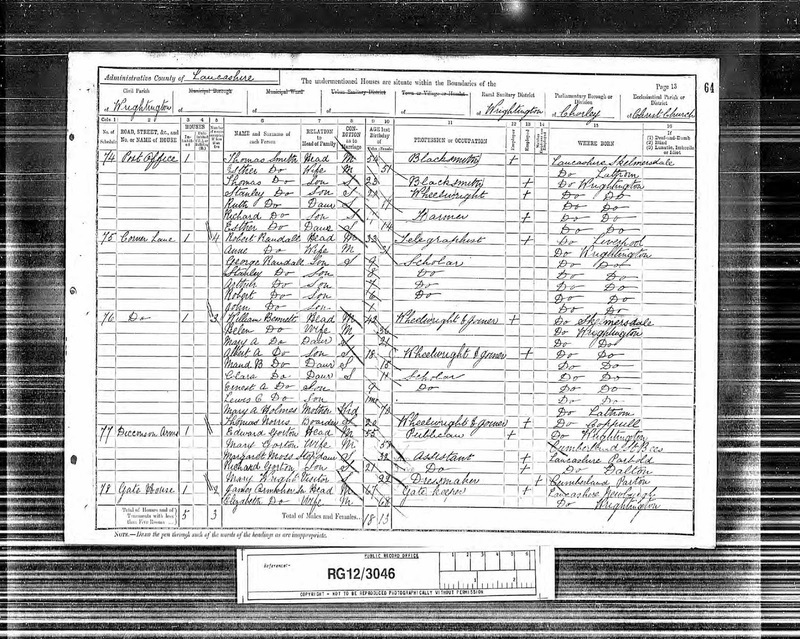 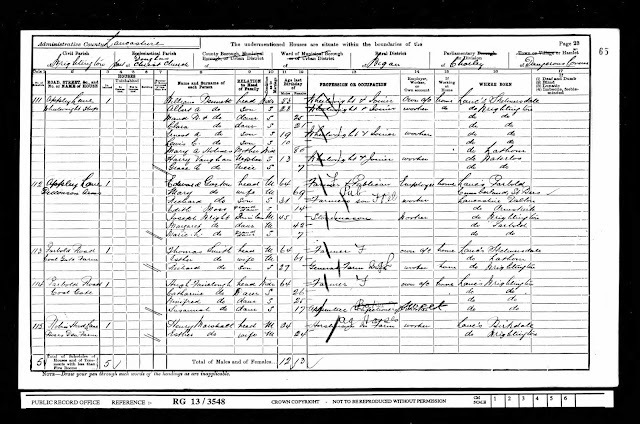 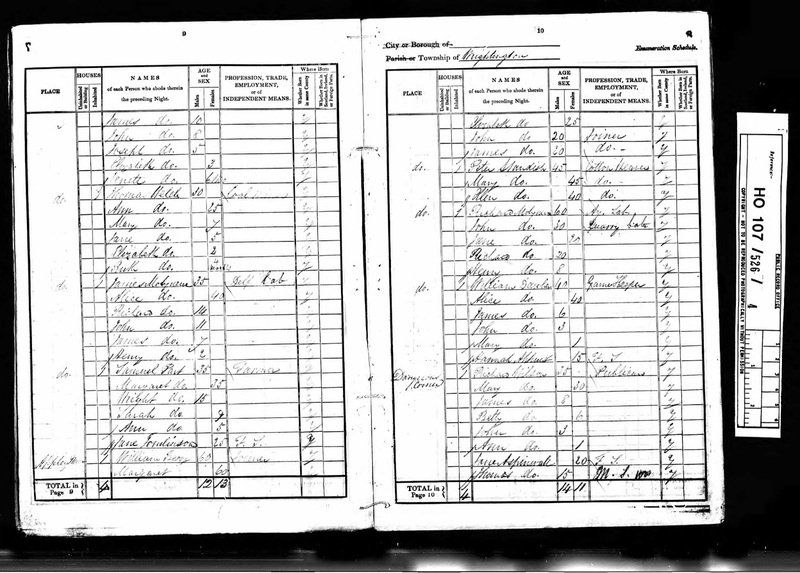 Edward's second wife was Mary Moss (nee Shackley), marrying in Sept 1869, in Wigan, Lancs. In 1871 Edward was a Farm Labourer and they were living at Higher Lane, Dalton. 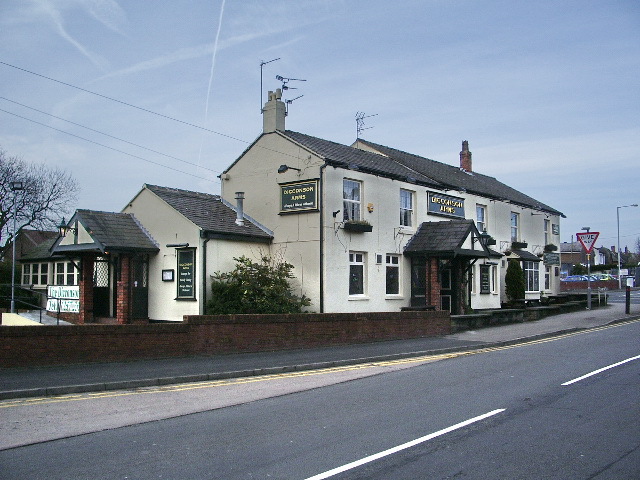 In 1881 Edward was now a Publican at The Dicconsons Arms Inn, Wrightington. 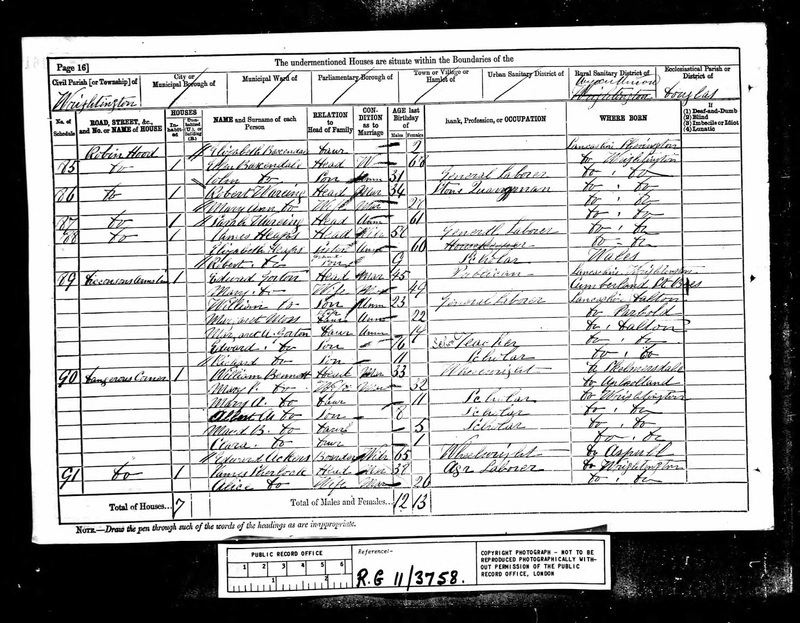 Margaret Moss (1859-) was Edward's 22 year old unmarried step daughter, Mary's daughter from her first marriage to John Moss in Wigan in Sep 1852. 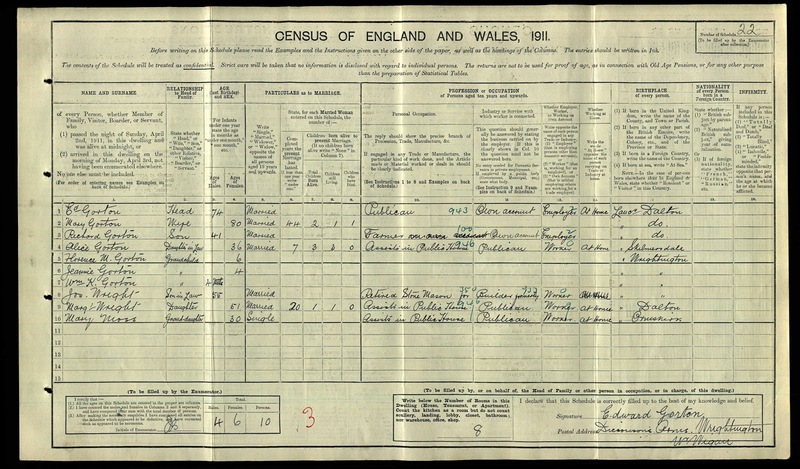 Mary's maiden name was Shackley. 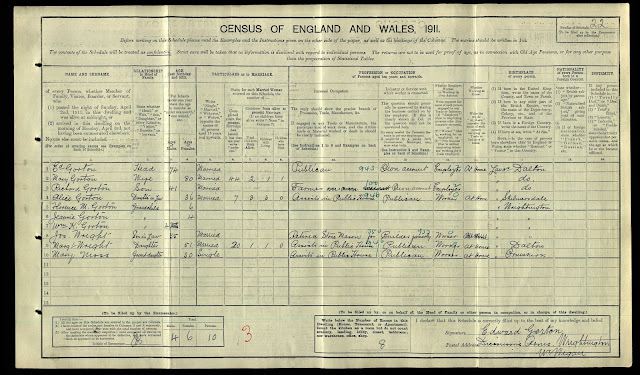 23 year old William was still single and worked as a general labourer. 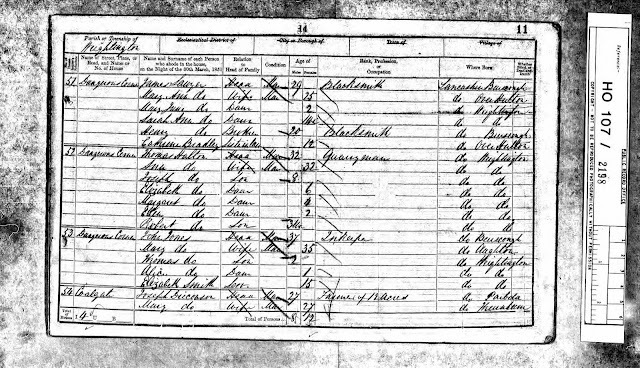 16 year old Edward junior was a School Teacher. 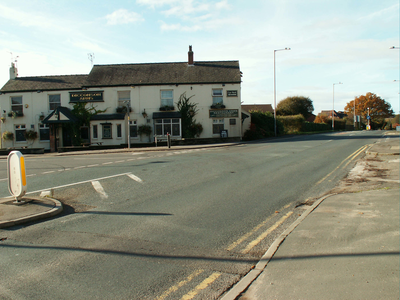 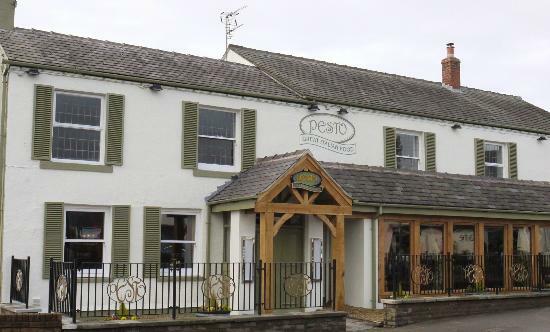 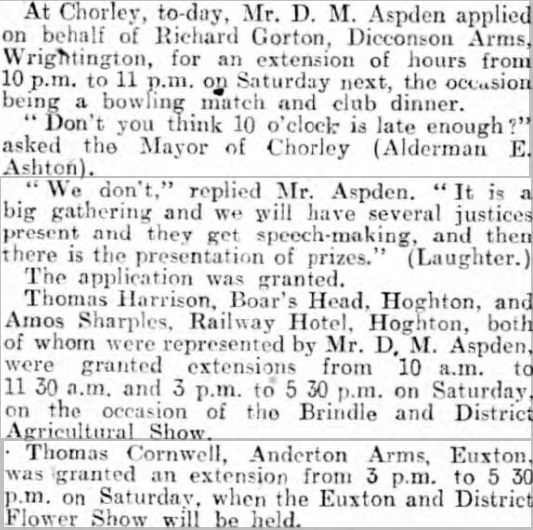 In 1891 Edward & Mary were still at the Dicconson Arms, Corner Lane, Wrightington, Shevington. 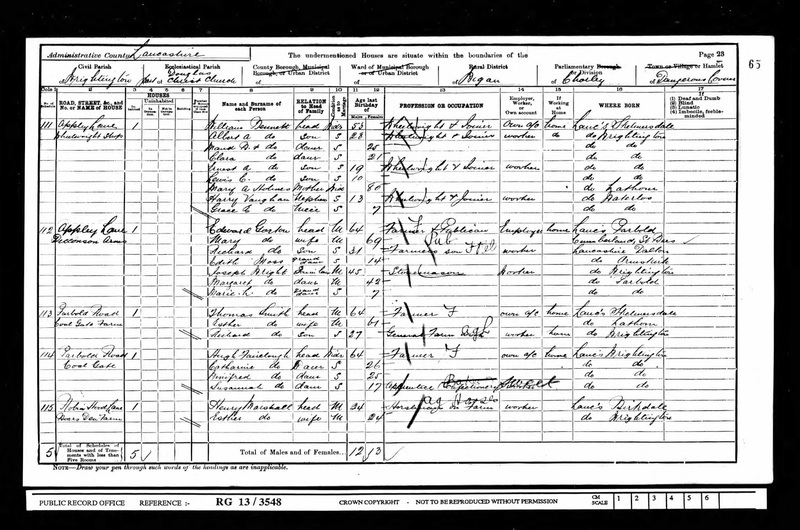 In 1901 Edward & Mary remained at the Dicconson Arms, but Edward was now a Farmer & Publican with unmarried Richard working on the farm. 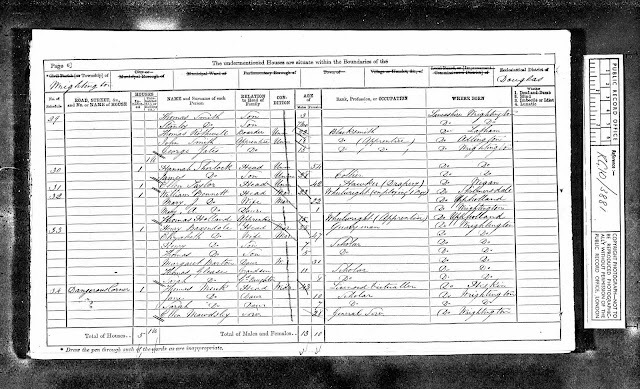 Edward (1836-1912) died December 1912, in Wigan, Lancs.